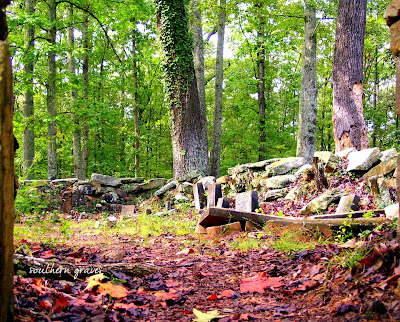 The original acreage of Indian Springs State Park was "acquired" from the Creek Native American tribe in 1825, and has operated as a park ever since. 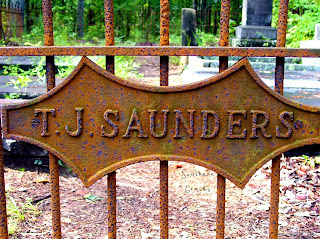 My one and only visit to a cemetery located within the boundaries of Indian Springs State Park at Butts County, Georgia was back in September 2007. 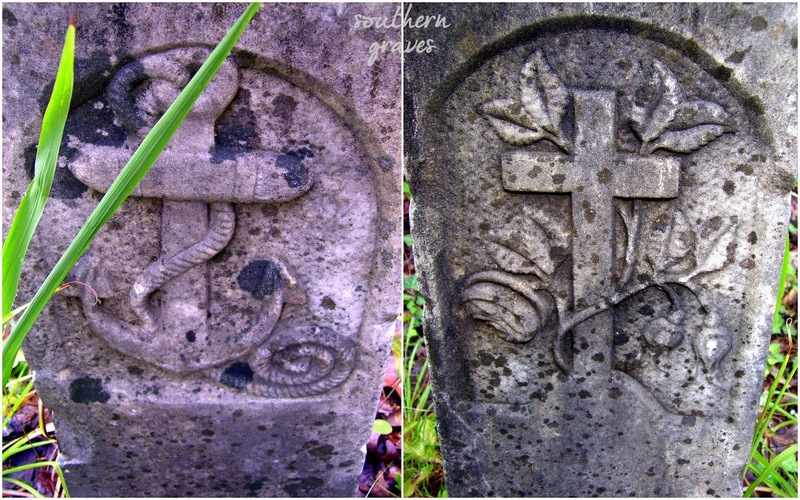 More than a decade ago, there was a ton of overgrowth, broken tombstones, stones knocked off their bases, crumbling surrounding structures, and general disrepair. Rumor has it, the condition of the cemetery only worsened. These images, as well as another article from another year later (2017), suggest progress is slow. I know it's thankless work to a large extent, but I hope the groups involved see it to completion. Thomas J. Saunders was born 4 July 1809, likely in North Carolina, and later married Elizabeth Patterson 14 June 1838 in Butts County, Georgia. 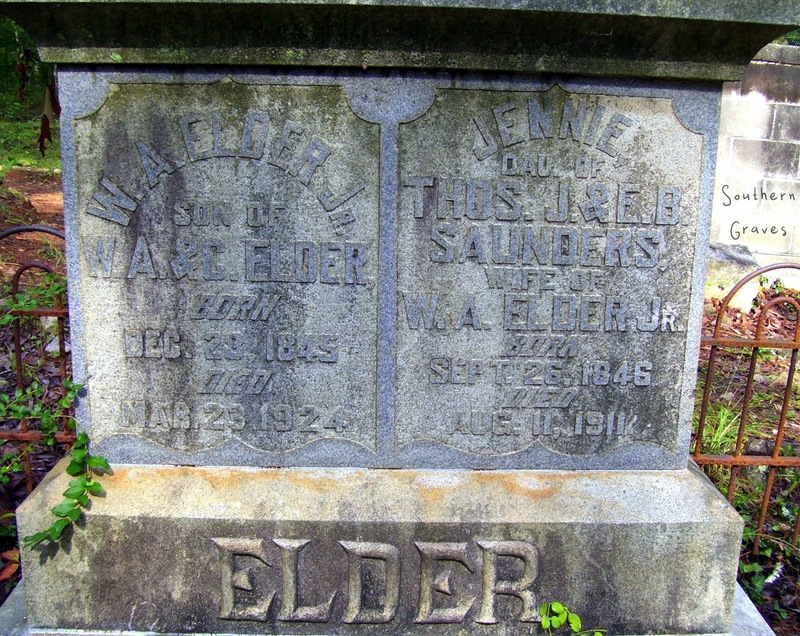 The couple, based on census records and tombstones, appear to have had ten children. In addition to Thomas and Elizabeth, seven of those children are memorialized in the family lot at the cemetery of Indian Springs State Park. One stone in the lot was, at one time, topped with an obelisk bearing a carving of an anchor of hope on one side and a cross with an intertwining vine of roses with buds on the other. And you are fully blest. 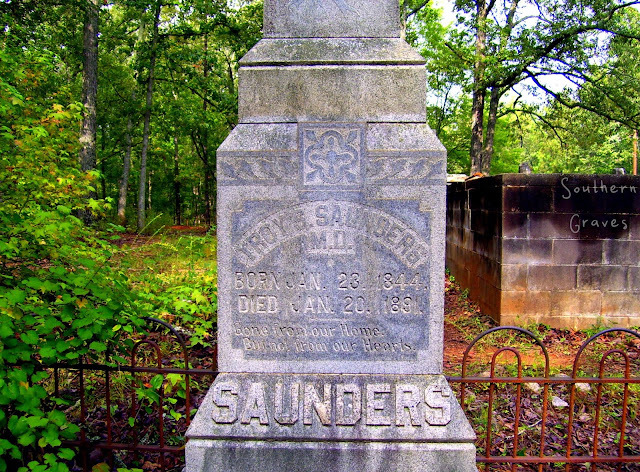 Departed this life, at Indian Spring, Ga., on Saturday, 2d day of August, after a long and painful illness, Mrs. Elizabeth Saunders, the faithful wife of Mr. T. J. Saunders, aged sixty-three years and four months. 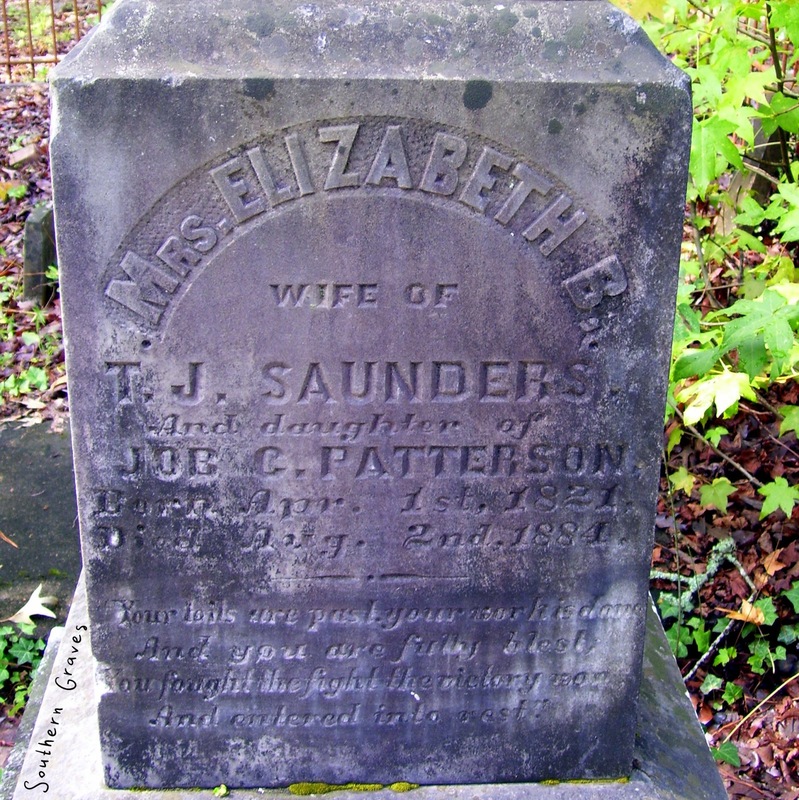 Mrs. Saunders was the daughter of the late Job Patterson, of Alabama, from whom she inherited, eminently, a character of rare worth. In the sacred relation of wife and mother her crowning virtues found their true sphere. She was one of those noble women of her day who recognized the true mission of her life, in devotion to all the practical duties of home. In this sacred precinct she labored with heroic energy and self-sacrifice, through long years of acute physical suffering. During her last days on earth her body was comparatively free from pain, and she talked calmly and quietly to each member of her family, leaving with them loving and practical lessons of life and death. Till her last moments she fully retained her mental faculties, and, with a "heart full of love for all mankind," she was resigned to her Master's call. If the best medical skill of the land, administered by the tender hand of a noble and only son, the watchful devotion of husband and daughters could stay the angel of death, then our friend would be with us still, for surely nothing was wanting that generous love could supply. Words can never express the desolation that the heart feels for such a bereavement. A mother's place can never be supplied. God, and time, alone, can give us strength to endure life, and see the silver light to the cloud that has darkened life. Two more children of Thomas Saunders and Elizabeth Patterson have tombstones in this family lot. First is Troy Simon Saunders, M.D. (1844-1891). He was the "noble and only son" mentioned in Elizabeth's obituary, and his tall obelisk was intact at the time of my visit. 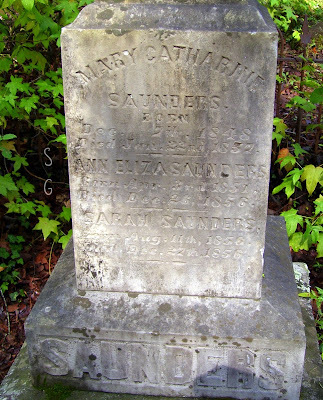 Finally, there's Virginia "Jennie" Saunders (1846-1911). She and husband W. A. Elder (1845-1924) rest there as well. · Cornelius J. (b. abt 1835): Not sure about him. Only in 1850 census; possibly deceased by 1860. Why not named on stone? · Susan P. (b. 1851-1854): Married Isaac Slaughter in Butts County. 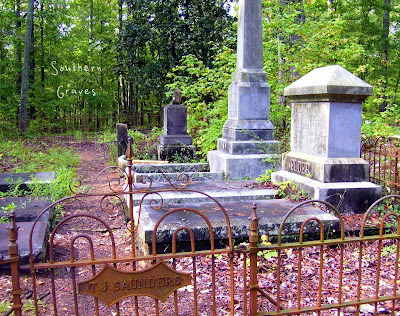 · Allie T. (b. abt 1858): aka "Lula?"